The story of former Apple CEO Steve Jobs has been told multiple times through several different mediums. Actors from Noah Wylie to Ashton Kuchar have had a chance to play the man in the Dad jeans and black turtleneck who helped revolutionize the tech industry. 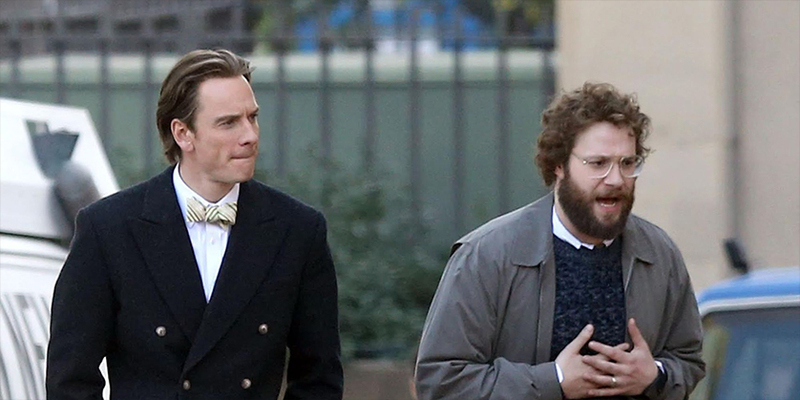 Now it's Michael Fassbender's turn to take the reigns in Danny Boyle's Steve Jobs, a blow-by-blow look at the career of the computer visionary through three key product launches. Boyle gives us Fassbender as Jobs and lets him lead the show, he commands the screen every time he's on it and does a great job of showing the passion that drove Apple to grow into the cult company it is now. Jobs is portrayed as a heartless genius who only cares about the bottom line and wants to do everything his way. The idea of a closed computing infrastructure (different from Windows and *now* Android) comes off as a giant ego trip. I've always been more of an Android guy than an Apple guy and this film reinforces my beliefs. Fassbender embodies the sliminess and calculating nature of Jobs, showing how careless he is of the important people in his life. He is simply one of the best actors working today and will certainly be one of the front-runners for Best Actor at the Oscars. Aaron Sorkin wrote this film and a lot of it plays like The Social Network (which he also wrote). If you enjoy heavy talking and confrontational conversation in your films, you'll probably enjoy Sorkin's script here. 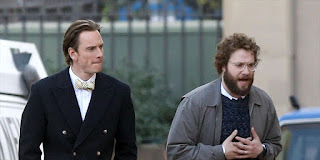 We see frequent arguments and back-and-forth between Fassbender, Kate Winslet (as Jobs' work-wife Johanna Hoffman), Seth Rogan (Steve Wozniak) and Jeff Daniels (former Apple CEO John Sculley). The huge problem in my mind is that almost all of these scenes are set right before a key product launch (Macintosh, NEXT Cube and the iMac). It's just hard to believe that all of these meaningful conversations actually occurred minutes before Jobs would go on stage to make a major announcement. Maybe it's because I work in the tech industry that I was disappointed by both The Social Network and this film. I feel that I am looking for more scenes about the technology involved and not the verbal confrontation between titans of industry. Unfortunately, Danny Boyle doesn't really have much to do in this film as a result of the script. We see audience shots, shots of Jobs going on and off stage and that's about it. There are some flashback sequences to Jobs and Woz working in a garage but that's about it. We've seen Boyle at his best in Slumdog Millionaire, 127 Hours, 28 Days Later, etc.. All of these movies allow Boyle to get creative with his camera work but Steve Jobs and Sorkin's script lock everything into green rooms and auditoriums. It becomes monotonous at times and I just kept waiting for something different. The film doesn't even touch on the iPhone and only hints at the iPod towards the end of the movie. I left the theater feeling very unsatisfied. Rogan as Wozniak brings a breath of fresh air to a droll film. It's fun watching him counter Jobs' beliefs and the audience really ends up siding with him during key moments of the film. I think this is Rogan's most "grown-up" performance and might actually deserve a Supporting Actor nomination. Without a doubt it's the acting from Fassbender and Rogan that is the main highlight of this movie, without the two of them bringing their A-game, this film would probably be unwatchable. Steve Jobs is a one-note film that becomes very repetitive at times and clearly shows the faults of a creative genius without showcasing a lot of his accomplishments. I really would have liked to have seen Jobs interact with the world outside of auditorium backstages. The only reason I am not putting this in the 2 JR range is because of the excellent acting from everyone involved. This is one of Danny Boyle's more forgettable films and I reluctantly give Steve Jobs 3 out of 5 JRs. If you do see it, WAIT for video. This film definitely does NOT needs to be seen on a big screen but it is worthwhile to watch for Fassbender and Rogan's work. I saw two other movies within the past few weeks and wanted to give a quick-hit review of each of them. Pawn Sacrifice is the story of chess prodigy Bobby Fischer (Tobey Maguire), his rise to stardom and his epic battle with Boris Spassky (Liev Schreiber) in Iceland in 1972. This movie had its slow moments but gave an in-depth look at the US/USSR cold war rivalry that was duplicated as a chess game between two great players. You really get to see the madness behind Bobby Fischer's greatness as well. Maguire was a little over-the-top in his portrayal but it's a film you should catch on video. Goosebumps is an adaptation of R.L. Stine's kids' book series that features monsters coming to life directly from the page of spooky books. Jack Black stars as Stine with help from Amy Ryan and a competent supporting cast of teen actors. This film is very funny and entertaining from start to finish. Black is great and the monster visual effects are really well done for a PG movie. The premise is ridiculous but executed well. I would recommend this film to anyone who has young kids. 3.5 JRs for Pawn Sacrifice and 4 JRs for Goosebumps.